The Guinness Book of Records is a book published annually since 1955, which contains all the records in the world, from natural to humans, to the most original and, of course, the chili he joined side. The record, however, is not unique to the chili spiciness but also the size. The record holder for the biggest chili in the world is a sample of the variety 'NUMEX Big Jim’ which was developed at NMSU in 1976. However, is the spiciness that brings the chili to collect more new records. The hotness of a chili is measured in terms of Scoville units (SHU), a scale established by the American chemist Wilbur Scoville, while working for the pharmaceutical company Parke-Davis in 1912. Hottest chillies are, botanically speaking, members of the species known as Capsicum chinense Jacq., in honor of the botanist Nikolaus Joseph von Jacquin. 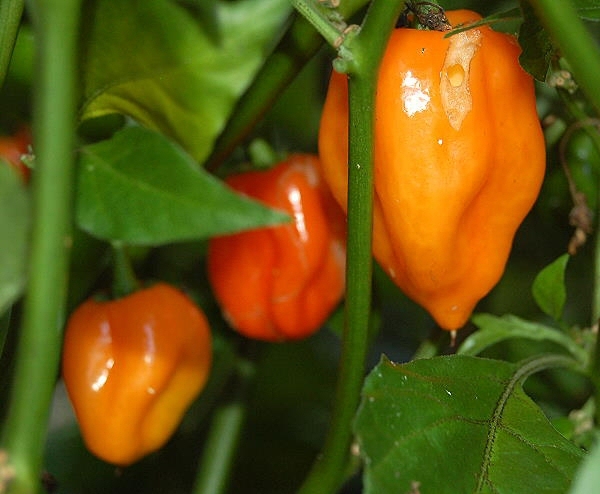 In 1994, the first holder of the world record was generally accepted at the Red Savina Habanero cultivated a kind of Frank Garcia after discovering a plant with red fruit that grew in the middle of a field of Habanero Orange in 1989. Tests carried out, this developed a new variety of measuring 577,000 SHU. The Red Savina or SavinaTM Red is a trademark of spices, the GNS Inc in Walnut, California, and is protected by the law on the protection of plant varieties from United States Department of Agriculture. The Red Savina remains undisturbed until 6 September 2000, when the BBC reported on the request made by RKR Singh’s Defence Research Laboratory in Tezpur in Assam, India, which had identified a chili that had registered 855,000 SHU. This chili was variously called, ’Chili Tezpur’ or ’Indian PC-1’, but most chose to call it the Naga Jolokia or Naga Jalakia, the ’chili of the Nagas’, (The Naga is the warrior clan that had given the name the Indian state of Nagaland). This statement was greeted with skepticism by many Western sources, in particular by Paul Bosland of the Chile Pepper Institute, who argued that Indian scientists had not calibrated their HPLC equipment properly. E ’was also questioned whether the scientists of the Indian Defence Research Laboratory were correct in their identification of this new cultivar identified as a specimen of Capsicum frutescens, which had given the formal name of Nagahari. The DNA test proved later that it was a hybrid between species, mostly C. chinense with some genes of C. frutescens. Meanwhile, in 2001, Dr. Paul Bosland get Bhut Jolokia seeds gathered by an aide during a trip to India. In fact, Naga Jolokia, Bhut Jolokia and Nagahari, also known as Bih jolokia or Borbih jolokia, chili peppers are the same, but denominated in different ways in different places.) 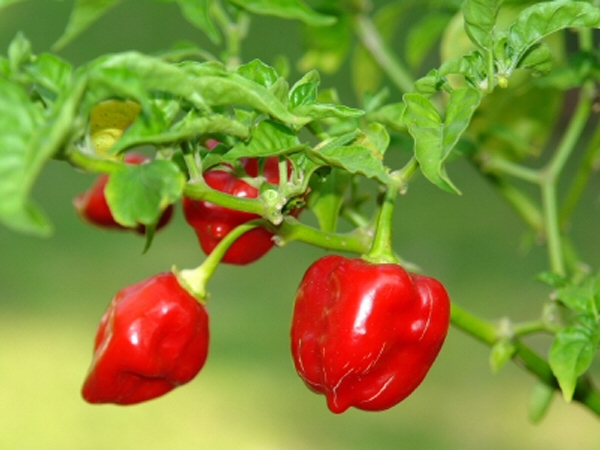 Despite a number of problems to get fruit until 2005, the Chile Pepper Bhut Jolokia cultivated the Institute along with the Red Savina and all’Habanero Orange, and tests carried out by HPLC resulting in summer 2005 showed the Red Savina with a record of 248.556 SHU, the Habanero Orange to 357.729 SHU, and the Bhut Jolokia with 1,001,304 SHU. 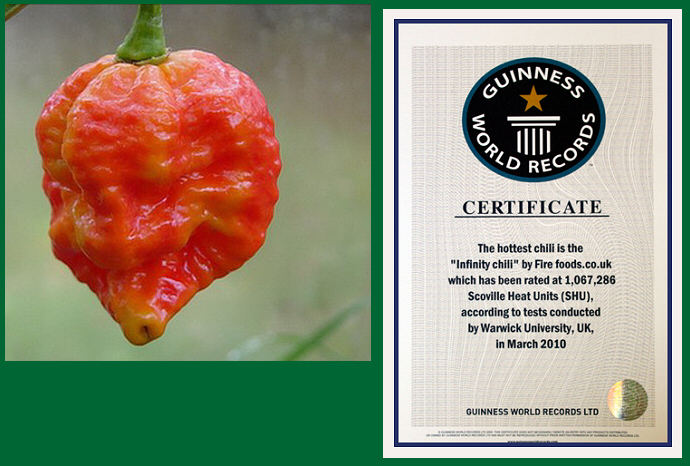 On September 9, 2006, the Guinness World Records recorded the Bhut Jolokia as the spiciest chili. Dr. Bosland will announce in February 2007 at the New Mexico Chile Conference. However, at this time an Indian company for agricultural development known as Frontal Agritech based in Jorhat in Assam had already cultivated a variety of chili called Bih Jolokia and that he had recorded an SHU level of 1,041,427 in 2004, while in October 2006 , just a month after the Chile Pepper Institute received a certificate from Guinness World Records, the Gardeners World from the United Kingdom at the University of Warwick sent a hot chili pepper grown in England called Dorset Naga, who claimed to be a selected strain of a chilli known as Naga Morich in Bangladesh and who recorded an astonishing 1,598,227 SHU, one of the levels of spiciness ever recorded for a chili. 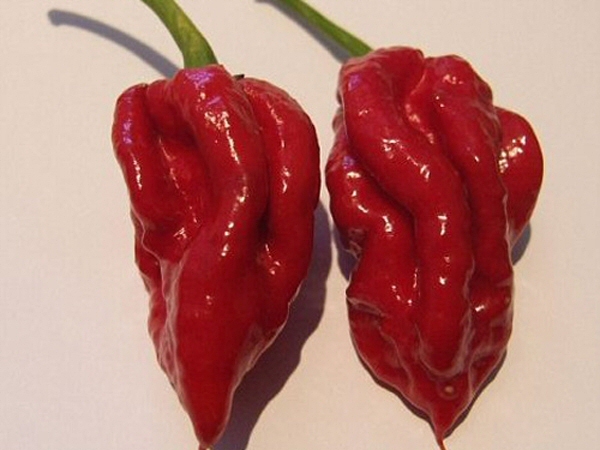 Since then, the Infinity chilli pepper, the Naga Viper, Trinidad Scorpion Butch T Trinidad Moruga Scorpion have surpassed the Bhut Jolokia in Scoville units. 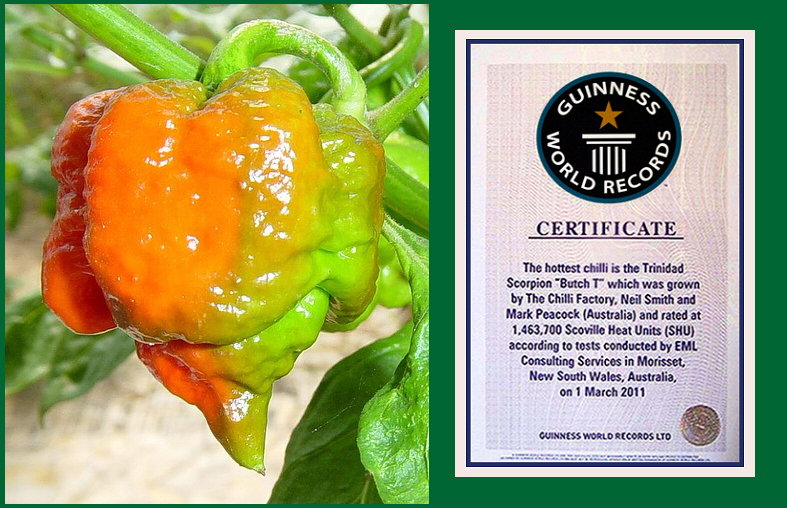 In February 2011, the Guinness World Records bestowed the title of World’s Hottest Chilli the Infinity Chilli (1,067,286 SHU), created and grown in Grantham, Lincolnshire, England by Nick Woods, for two weeks. 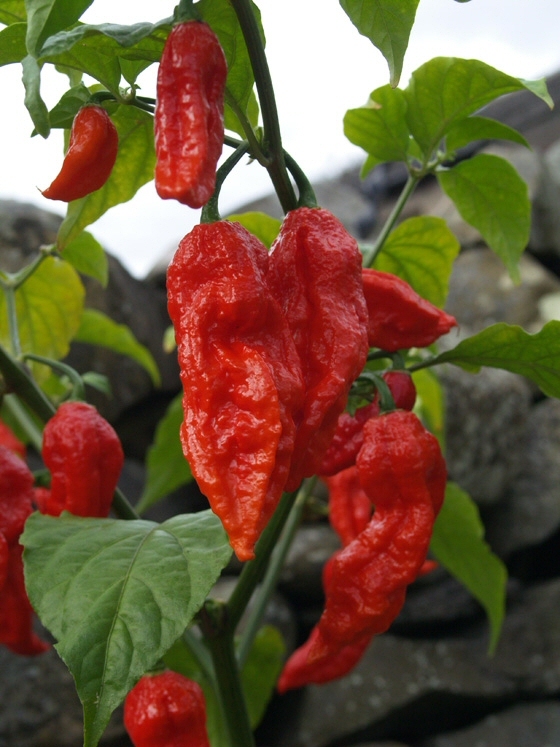 In fact, February 25, 2011, was ousted by the Naga Viper (1,382,118 SHU), created and cultivated in Cark, Cumbria in England by Gerald Fowler of the Chilli Pepper Company. Because of its hybrid nature, however, the Naga Viper is still not able to reproduce exactly like the previous generation. The Chilli Pepper Company is still continuing its work to stabilize the variety. Butch Taylor owner of Zydeco Hot Sauce in Crosby, Mississippi, creates and grows hot peppers for years for his company. He attended a forum and exchange of seeds Trinidad Scorpion Jonah Strain with Neil Smith of the Hippy Seed Company, Central Coast of NSW, Australia. Neil brings the seeds to Marcel de Wit of The Chilli Factory in Morisset, Lower Hunter Valley, Australia, to cultivate them. During the cultivation notice a difference in color and shape of the fruits suspecting a new variety. They decide to call it "Trinidad Scorpion Butch T" in honor of Butch Butch Taylor’s surprise. The 1 March 2011 they conduct tests by EML Consulting Services in Morisset, New South Wales, Australia which recorded a specimen of Trinidad Scorpion Butch T at 1,463,700 SHU. The Guinness World Records verifies and certifies the new record. Now what? The conflict for control of capsaicin has become too profitable for a truce. 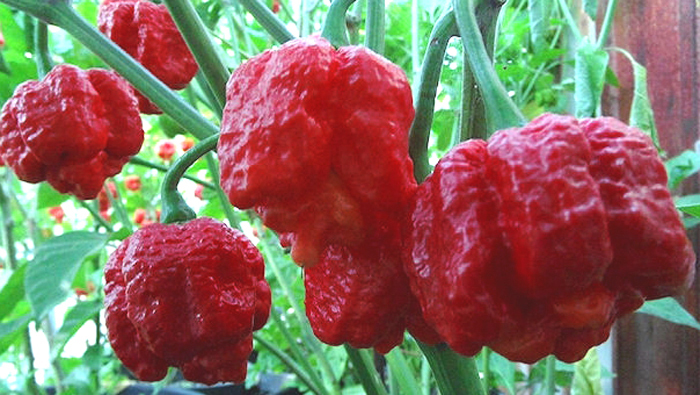 As of February 2012, the New Mexico State University Chili Institute, has identified the Trinidad Moruga Scorpion as the hottest chilli in the world, with a maximum recording of 2,009,231 and an average of 1,200,000 SHU. The Guinness World Records, however, did not have concrete data to be able to record. 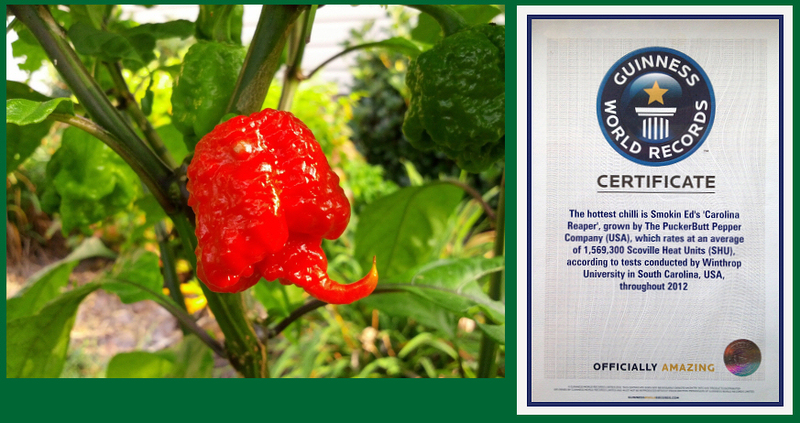 In the early days of November, 2013, the Guinness World Records says a new record for the "Carolina Reaper" which according to tests carried out in 2012 from Winthrop University in South Carolina, has an average of 1.5693 million with a peak of 2,200,000 SHU. Developed by Ed Currie farmer in his greenhouse in Rock Hill, South Carolina. Originally known by the name of HP22B, Carolina Reaper is a selection of a cross between a red Habanero from the island of St. Vincent in the Caribbean, and a Naga from Pakistan. Ed, the owner of the PuckerButt Pepper Company located in Fort Mill, South Carolina, has invested $ 12,000 to get this variety of Capsicum chinense. Smokin Ed’s Carolina Reaper ® is a registered trademark.